Watch this video to learn how ice dams form and how A NO Dealers, your local Dr. Energy Saver contractor, can help prevent them! 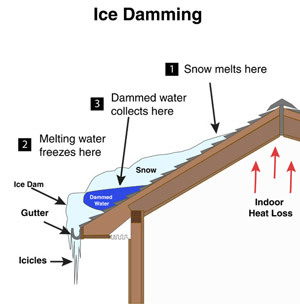 Ice damming creates more than just exterior damage to the rain gutter system, it also causes water to leak into the attic, soaking the wood, insulation, the flooring/upstairs ceiling, and even the valuables being stored up there. Bolster-DeHart, Inc. can prevent this all from happening by keeping the roof cold -- by sealing air leaks and improving the attic insulation. Our insulation and air sealing services keep your attic the appropriate temperature to prevent and remove ice damming in Gibsonia, Monroeville, Bethel Park, Mckeesport, Coraopolis, Aliquippa, Mars, Allison Park, Gibsonia, and the surrounding cities and towns. A roof begins to heat up when the warm air from the lower living space leaks into the attic (view example to the right). The snow will begin to melt unevenly -- because some parts of the roof will be warmer than others. Ducts require particular care and attention. Your furnace may heat the air up to 100 degrees or more and send it through leaky sheet metal ducts through a 30 degree attic. It's inevitable that heat gets into the attic it's running through. Which means you get less heat delivered to the room intended - so you have to run the furnace more to keep your home heated - and that costs you money. Ducts must be sealed to prevent leaks in an attic and insulated well to prevent heat loss (and heat gain in the summer). Attic vents are less necessary in an attic that is properly air sealed, insulated, and has it's ducts taken care of properly; however, the ducts will keep the roof deck very close to the outdoor temperature, since they don't have all the heat (and moisture) to vent out as they did before the home was "fixed". Air sealing should ALWAYS be done before adding home insulation in PA or anywhere for that matter. A contractor who wants to hastily blow insulation in an attic without air sealing first, is taking the easy way out. Proper air sealing is much more difficult and takes much more time on average than blowing insulation. But with air sealing you don't see so much of the work when you scan the attic, and with blown-in insulation you see a lot; so it looks like something substantial was done. The insulation contractor who blows insulation without air sealing first is committing malpractice and doing the customer a great disservice. Why? Now all those air leaks (can lights, drywall to stud seams, pipe and wire holes, openings around chimneys and duct chases, etc.) that need to be sealed are buried under a foot or more of insulation. They are very, very difficult to get to ever again. But won't insulation stop air leaks? No way. Insulation lets air flow right through it. It's like having a winter coat on with just the stuffing, not the nylon shell. A closeup of what ice damming could look like in PA. If your guests have to dodge icicles while walking to your front door, your home has already fallen victim to ice damming. With the appropriate air sealing and attic insulation, your Bolster-DeHart, Inc. expert will have your home's roof warming up and the icicle formations in remission. Your guests no longer have to run to the door with trash can lids above their heads for protection. 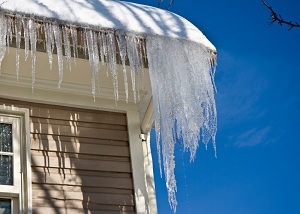 Get Your Ice Damming Prevention Done Today! Call or contact us online to schedule a Free Estimate to prevent ice damming in Bethel Park, Gibsonia, Monroeville, Allison Park, Mckeesport, Gibsonia, Mars, Coraopolis, Aliquippa, and more. We also offer a comprehensive home energy audit.